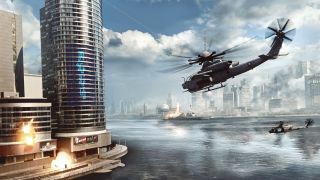 Presented as the poster child for DICE’s new “levolution” technology (something which has sadly taken a backseat in the studio’s more recent titles), Battlefield 4’s Siege of Shanghai map became an instant hit with the Battlefield community upon the game’s release in 2013, quickly hailed as another series classic up there with Wake Island and Operation Metro. In the four years since that time, Battlefield 4 has been inundated with expansions, free content, and updates, while most of us - including DICE - has moved on to new things. But a significant core community of players have stayed with Battlefield 4 ever since and, on console, it’s more than likely that you’ll find most of them playing Conquest on Siege of Shanghai. This isn’t to say that all those thousands of people are exclusively playing on a single map - Operation Locker and Golmud Railway infrequently pop up as one of the few viable alternatives depending on the time of day - but it is to say that Siege of Shanghai unquestionably dominates the schedule of the Battlefield 4 user base. This is less of the case on PC, as the expanded options for server ownership and community management makes it more viable to entertain other modes and maps, but Siege is still a popular go-to on that system too. But what is it that makes Siege of Shanghai so replayable? Well, after all the controversy surrounding its rocky launch dominated the public discussion for weeks on end in 2013, it quickly became easy to overlook the fact that, at its core, Battlefield 4 is a really good game. Beautiful, expansive, robust, rewarding, and the last DICE game to really double down on the sandbox elements of the studio’s formula for multiplayer warfare - it kicked off the next generation in all the right ways. In theory, Siege of Shanghai represents the harmonic culmination of all those ideas within a single playground; a map where all manner of vehicles attack each other from land, sea, or air, where the space of play feels as vertical as much as it does horizontal, and where the visual scope of DICE’s vision is really able to come into its own. And at the centre of it all is that skyscraper, the nucleus at the heart of the mayhem, and a key control point that both sides are immediately drawn towards. Ascend its peak, and you’ll find a heated firefight that, in another game, could easily be mistaken for its own separate match. In Siege of Shanghai, however, it’s merely the eye of the storm in a massive, dynamic environment of ongoing warfare. As I said, though, that’s all in theory. In reality, Siege of Shanghai is as controversial a map as as it is ubiquitous, not to mention a user experience made up of extreme highs and lows, thanks to the way in which fights now play out. Many active Battlefield 4 players were eager to describe their love-hate relationship with Siege of Shanghai to me, and offered their take on why the map remains so popular despite its contentious nature. "I think Shanghai's greatest appeal is its novelty, not great map layout or any other important factors." Helicopters are definitely the hot button issue at the crux of the Siege question. Even after playing a single round of Conquest, I found myself repeatedly mowed down and increasingly aggravated by the same helicopter pilot, who hovered around the tower like a vulture, raining down hellfire on anyone out in the open with the sort of speed, precision, and merciless efficiency that you would begrudgingly expect from a player with four years of experience. I’m sure they were having a grand old time, but for everyone else, it was a nightmarish cycle of instant death that felt extremely unfair, especially as the same player held the same helicopter for the entirety of the 60 minute match. Deathwhisperz is someone who takes a less critical disposition towards Siege, instead suggesting that its timeless appeal is a product of its variety. They’re not wrong about the skyscraper, either, at least from a visual standpoint. Once the tower takes enough damage, the ‘Levolution’ mechanic triggers, and the entire building will begin to plummet into a pile of rubble and dust, with anyone caught within, below, or on top of it doomed to a humiliating fate. After that, the control point is fought atop the remnants of splintered concrete and metal but, despite its conceptual and visual allure, this transformation to the playing field is yet another point of contention amongst players. In other words, the tower’s very presence only serves to further facilitate and accentuate Siege’s biggest problem of air superiority, but it’s not a universally hated gimmick. ClaptrapBeatboxTime, for example, explicitly points to the tower when asked why the map still remains a personal favourite of theirs. It seems to be that your opinion of Siege greatly depends on how you prefer to play and enjoy Battlefield. For those who delight in the chaos of the imbalanced interplay and cheap trickery which currently dictates activity on the map, then Siege’s popularity makes perfect sense, especially for savvy pilots looking to score easy kills. But for players who want something more varied, welcoming, well rounded and meaningful, the frustration is valid. Others who may also be less satisfied with the current state of Battlefield 4 are those who own or recently bought the Premium Edition, which comes packed with all of the game’s DLC. Very few servers on console are dedicated to Battlefield 4’s post-launch content which, for some, might have been their exact reason for picking the slightly pricier Premium Edition over a standard copy. In essence, they’ve invested in a game that made promises it can no longer keep. This isn’t necessarily DICE’s fault, as no one can predict what a game’s online community might look like four years on from release, but the case study of Battlefield 4 is a reminder of multiplayer gaming’s precarious inconsistency when measured over time. Players who bought Lawbreakers only a few months ago are now struggling to find matches, Overwatch regulars are having to deal with increasingly hostile team-mates, and former fans of The Tomorrow Children can’t even play their favourite game anymore. The online game you buy today might be a different experience in a year’s time and, as Battlefield 4 demonstrates, those changes aren’t always for the best.